Source: Rebecca Winborne, Maplewood Cemetery, Wilson. Photo courtesy of Deborah S.
The grave is marked by a stone slab, bearing the image of the first Confederate flag. The marker rests on a rough stone base. 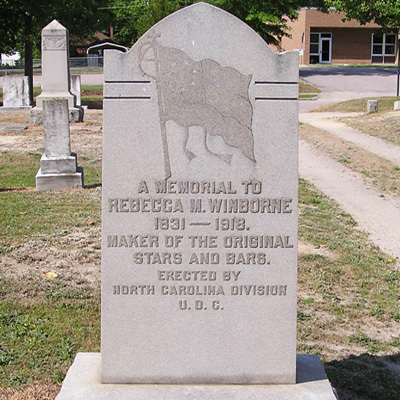 A MEMORIAL TO / REBECCA M. WINBORNE / 1831 - 1918 / MAKER OF THE ORIGINAL / STARS AND BARS. / ERECTED BY / NORTH CAROLINA DIVISION / U.D.C. The Wilson, NC chapter of the United Daughters of the Confederacy held a ceremony at the fifth annual convention of the NC Division of the Children of the Confederacy in 1921 to dedicate Mrs. Winborne's grave marker. First, the childrens chapter strew flowers on the grave. Then the grandchildren of Mrs. Winborne unveiled the marker, which was draped in a Confederate flag that belonged to Jessica Smith, the daughter of Confederate flag designer Owen Randolph Smith. Known as the "Betsy Ross of the Confederacy," Catherine Rebecca Murphy Winborne (November 22, 1831-July 23, 1918) is notable for sewing the first Confederate flag. It was designed by Orren Randolph Smith of Henderson, North Carolina. The flag was adopted by the Confederate Congress on March 4, 1861, and the full 9 x 12 foot flag was first raised in the Franklin County Courthouse square in Louisburg on March 18, 1861, two months before North Carolina seceded. There is a monument in the square commemorating the spot. Modern scholars think it is more likely that Nicola Marschall, an artist on the faculty of Marion Female Seminary in Marion, Ala., submitted the favored design. Maplewood Cemetery is located at 400 College Street, Wilson, Wilson County, North Carolina, 27893. The marker sits in the grass in the graveyard by a sidewalk.